Here's how to set up and pair your Apple Watch (Series 1 & 2) with your iPhone. Support page for the Apple Watch Series 3. Support page for the Apple Watch Series 4. Here's how to activate an iPhone shipped to you or after upgrading from a previous device. Here's how to create an Apple ID to access your personal account for iOS services. Here's how to activate and setup your iPhone 6. View this info to learn how to turn your iPhone 6 or 6 Plus on or off. Here's how to manually choose a carrier if your iPhone shows 'No Service' or 'Searching' while roaming. Here's how to update carrier settings for your iPhone. Here's how to add and manage Reminders for your iPhone. Here's how to download and install the Content Transfer app on your iPhone. Here's how to download and install the Content Transfer app on your Apple iPhone. Here's how to transfer content with the Content Transfer app with your Apple iPhone. Compare iPhone features. 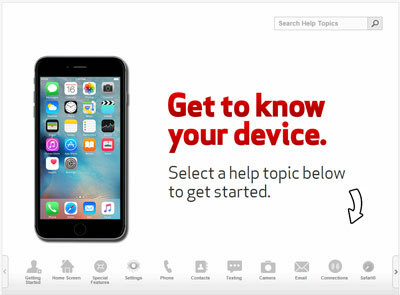 Learn about using iPhone on the Verizon Wireless network, including info on different iPhone models, iTunes®, Visual Voicemail and more. Here's a link to info on how to enable LTE on compatible iPhones for faster data and HD Voice. A visual guide of the indicator icons on the Apple iPhone 6. A visual guide of the main buttons and functions of Apple iPhone 6. Here's how to change your mobile number in the GizmoHub app on your iPhone. Here's how to view or hide the remaining battery percentage on your iPhone. Here's how to see charging status, battery life and which apps or processes use your iPhone's battery. Explore how to monitor and manage the power supply on Apple iPhone 6. Here's how to make your iPhone visible to Bluetooth devices. Here's how to turn Bluetooth for your iPhone on or off. Here's how to unpair a Bluetooth accessory from your iPhone. Learn how to pair Apple iPhone 6 with your Bluetooth device. Here's how to add, delete or edit info in your iPhone's calendar. Here's how to set the default calendar on your iPhone if you have multiple calendars. If you can't hear a person's voice clearly or hear crackling, static or experience poor voice quality while on a call or listening to a voicemail, view this info. Learn about Verizon Wireless services offered in Alaska, including plans, what devices are available and upcoming enhancements. Here's how to set up your iPhone to use Wi-Fi calling when available. Here's how to reject calls on your iPhone and send them directly to voicemail. Here's how to place a conference call from your iPhone. Here's how to send a message instead if someone's calling your iPhone and you're not able to answer. Here's how to auto dial Verizon services (e.g., Check Bill Balance, Pay My Bill, etc.) from your iPhone. Here's on how to place a voice call from your iPhone. Here's how to simplify the process of placing a call from your iPhone while outside the US. Here's how to schedule a call back reminder if someone's calling your iPhone and you're not able to answer. Here's how to place a voice call via Wi-Fi Calling on your iPhone. To turn the Voice Dial switch on your iPhone 6 or 6 Plus on/off, follow these steps. Here's how to make and receive calls on other Apple devices logged in to the same iCloud account. Discover how to save the number of someone who called you in your contact list of Apple iPhone 6. Learn how to change the call settings on your Apple iPhone 6. Explore how to make a call using Apple iPhone 6. Here's how to take photos at selected intervals by pressing the shutter button on your iPhone. Here's how to record and send a video message using your iPhone. Here's how to use your iPhone to take a wide-angle picture. Here's how to play a movie, TV show, etc., from the TV app on your iPhone. For info on common camera settings (e.g., flash, HDR, etc. ), check out this info. Discover how to record a slow-motion video with Apple iPhone 6. A visual guide to recording a video that plays back faster on Apple iPhone 6. Explore how to edit the pictures you take on Apple iPhone 6, like crop, filter and more. Learn how to record a video using Apple iPhone 6. Explore how to use and switch between the front and rear-facing cameras on Apple iPhone 6. Learn how to take a picture using Apple iPhone 6. Here's how to back up your contacts on your iPhone via Verizon Cloud. Here's how to add a contact to your iPhone. Here's how to delete a saved contact from your iPhone. Here's how to edit a contact on your iPhone. Here's how to remove duplicate contacts if you are using multiple backup options on your iPhone. Learn how to add a new contact to the address book of Apple iPhone 6. Learn how to assign a picture to a contact on Apple iPhone 6. Discover how to assign a ringtone to a contact on Apple iPhone 6. A visual guide for removing a contact from the address book of Apple iPhone 6. Learn how to edit the information of one of the contacts save on your Apple iPhone 6. Discover how to transfer all of your contacts to or from Apple iPhone 6. Learn how to sync contacts between accounts on your Apple iPhone 6. Here's how to view data usage and turn data on or off for individual apps on your iPhone. Explore how to monitor and manage how much data you're using on Apple iPhone 6. Here's how to set whether time is manually or automatically entered and how it's displayed on your iPhone. Here's how to automatically populate the date and time based on your location on your iPhone. Here's how to view current carrier settings used to get the best network performance on your iPhone. Here's how to view your phone number from the contacts list or settings menu on your iPhone. Here's how to turn the 4G LTE setting for your iPhone on or off. Here's how to turn mobile data for your iPhone on or off. Here's how to manage the Do Not Disturb settings for your iPhone. Here's how to turn the Automatic Downloads setting for your iPhone on or off. Here's how to turn notifications on / off and choose how they display on your iPhone. Here's how to use Night Shift to adjust the screen on your iPhone to warmer colors after dark. Here's how to troubleshoot calling and data issues on your iPhone when traveling internationally. Here's how to turn cellular data for FaceTime for your iPhone on or off. Here's how to enable your iPhone to share content with other devices logged in to the same Apple ID. Here's how to adjust the backlight for your iPhone. Here's how to limit movement (shifting background, zooming, etc.) shown on the screen of your iPhone. Here's how to configure the display zoom settings on your iPhone 6 / 6 Plus. Here's how to set when and how you can access your iPhone's Control Center. Here's how to use your iPhone to contact emergency services and alert your emergency contacts. Here's how to share and download content download automatically to iOS devices tied to your Apple ID. Here's how to limit the advertising campaigns presented to you when using your iPhone. Here's how to view where an iPhone contact was imported from if it's linked with another contact. Discover how to access the mobile network settings on your Apple iPhone 6. Learn how to access settings on Apple iPhone 6 to change alert sounds, turn off GPS and more. Learn how to add a user account on your Apple iPhone 6. Explore how to use iCloud to back up all your important information and content on Apple iPhone 6. Discover how to configure account settings on your Apple iPhone 6. Explore how to set up and change the security on your Apple iPhone 6 to prevent others from using it. A visual guide for changing the sound Apple iPhone 6 makes when you receive a notification. Learn how to change name of your Apple iPhone 6. Learn how to update the operating system of Apple iPhone 6 when an update is available. Discover how to change the location settings on your Apple iPhone 6. Discover how to adjust your Background App Refresh settings to schedule your apps to update as needed without draining your battery on Apple iPhone 6. Learn how to clear all the personal information, apps and other data from Apple iPhone 6. Learn how to remove a user account on your Apple iPhone 6. Learn how to use your fingerprint to keep other people from using your Apple iPhone 6. An interactive guide for setting Apple iPhone 6 to Airplane mode. Here's how to remove and re-add an email account on your iPhone, which often fixes email issues. Here's how to enter or edit an email signature from your iPhone. Here's how to configure how often your iPhone checks for new email messages. Here's how to add a personal email account to your iPhone. Here's info on personal email settings and server addresses for your iPhone. Here's how to forward an email message from your iPhone. Here's how to manually add an email account to your iPhone if the automated process doesn't work. Here's how to create and send an email from your iPhone. Here's how to set corporate email settings on your iPhone. Here's how to reply to an email message from your iPhone. Here's how to add a corporate / work / Exchange ActiveSync email account to your iPhone. Here's how to view email messages on your iPhone. Learn how to access your work email on Apple iPhone 6. Discover how to access your existing email account on Apple iPhone 6. Explore how to the inboxes of more than one email account on Apple iPhone 6. Learn how to attach a file, like a document or photo, to an email with Apple iPhone 6. Here's how to turn location services for your iPhone on or off. Here's how to reset your saved location settings on your iPhone. Here's how to determine what the various icons on the display of your iPhone mean. Here's how to search for items using Spotlight Search on your iPhone. Here's how to reset the Home screen layout for your iPhone to default settings. Here's how to view notifications on your iPhone. Here's how to switch between Home screen panels and perform a search on your iPhone. A visual guide to adding and removing apps on the Home screen of Apple iPhone 6. An interactive guide on how to add folders to the Home screen on Apple iPhone 6 to help organize your apps. Here's how to set up or activate the hotspot on your iPhone for use as an internet / Wi-Fi connection. Here's how to turn Personal Hotspot, which makes your iPhone an internet connection for other devices, on or off. Here's how to change Personal Hotspot settings, like the Wi-Fi password, on your iPhone. Here's how change the Personal Hotspot password for your iPhone. Learn how to set a Mobile Hotspot password on Apple iPhone 6 to protect your data connection from unauthorized devices. An interactive guide for setting up Apple iPhone 6 as a Mobile Hotspot, so you can share your data connection with other devices. Here's how to save images viewed from websites on your iPhone. Here's how to prevent web pages from tracking you and creating a search history when you browse the internet. Here's what to check if you can't browse the internet or view website images on your iPhone. Here's how to edit a saved bookmark from the Safari browser on your iPhone. Here's how to delete a saved bookmark from the Safari browser on your iPhone. Here's how to bookmark a Safari website on your iPhone. Here's how to clear temporary files from your iPhone, which helps if web pages won't display. Here's how to access websites via the Safari browser on your iPhone. Here's how to open a saved bookmark from the Safari browser on your iPhone. Here's how to access the Safari web browser on your iPhone. Learn how to bookmark a website on Apple iPhone 6, so it's easy to find later. Learn how to change the content settings on your Apple iPhone 6. A visual guide for deleting the web browsing data stored on Apple iPhone 6. A visual walkthrough of opening, closing and switching between windows or tabs in the web browser of Apple iPhone 6. Here's how to configure the keyboard settings for your iPhone. Here's how to create a shortcut for commonly used phrases on your iPhone. Here's how to remove saved words you've typed on your iPhone and return your keyboard to its default dictionary. Here's how to change the language used on your iPhone. An interactive guide for changing the language settings on Apple iPhone 6. Here's how to turn off the security passcode for your iPhone. View this info to set the phone lock on your iPhone 6 / 6 Plus. Here's how to fix your screen/display on your iPhone if it doesn't flip or rotate. Here's how to add a fingerprint and enable Touch ID on your iPhone. Here's how to turn Touch ID on or off for the features available on your iPhone (e.g., unlock, purchases, etc.). Here's how to enable or disable Touch ID for use with screen lock and purchases. Here's how to unlock the screen on your iPhone 6 or 6 Plus. Here's how to scan your fingerprint to be used with Touch ID on your iPhone. Here's how to delete a saved fingerprint used to unlock and access features on your iPhone. Learn how to unlock the screen on Apple iPhone 6. Here's how to check storage space if your iPhone runs slow/crashes, apps freeze, or you can't save media. Learn how to find the apps or files that are taking up the most space on your Apple iPhone 6. Here's how to access the Control Center to control music and turn features on or off. Learn how switch between and close apps that are running on Apple iPhone 6. Here's how to modify the SIM PIN settings for your iPhone. Here's how to insert/remove a SIM to help when receiving activation errors ), having trouble with the browser or have a blank/frozen screen on your iPhone. Here's how to view the SIM card number on the iPhone 6s / 6s Plus. A visual guide for how to put the SIM Card into Apple iPhone 6. Here's how to turn Silent Mode on or off if your iPhone doesn't ring or vibrate or you want it to. Here's how to set ringtones and notification sounds for your iPhone. Here's how to utilize the speakerphone functionality on your iPhone. Here's how to set when your iPhone vibrates to alert you of an incoming call, text, or other notification. Here's how to change alert settings if you're not receiving audio notifications on your iPhone. Here's how to play music files you've downloaded to your iPhone. Here's how to troubleshoot your iPhone if it doesn't vibrate or alert you when receiving texts, emails, etc. To reduce background noise on calls, check out this info. Here's how to send a picture you've already taken with your iPhone via the Messages app. Here's how to turn group messaging for your iPhone on or off. Here's how to ensure MMS messaging for your iPhone is turned on if you're unable to send/receive picture messages. Here's how to create and send a text message from your iPhone. Here's how to take and send a picture on your iPhone via the Messages app. If you've turned iMessage off on your iPhone, here's how to enable SMS to send and receive messages. Here's how to send a saved video on your iPhone to a messaging recipient. Here's how to delete a text message from your iPhone. Here's how to save a picture and video on your iPhone. Discover how to send a video message on Apple iPhone 6. Learn how to send a recorded voice message to a contact with iMessage on Apple iPhone 6. Discover how to change messaging settings on your Apple iPhone 6. A visual guide for how to delete iMessage conversations on Apple iPhone 6. Discover how to send text-only messages with Apple iPhone 6. A visual guide for attaching a file, such as a picture or video, to a text message on Apple iPhone 6. An visual guide for how to stop being notified when you receive a new group message on Apple iPhone 6. Learn how to turn iMessage off and on with Apple iPhone 6. Here's how capture a screenshot on your iPhone. Here's how to set up your iPhone for printing. Learn how to adjust the settings for video calling on Apple iPhone 6. Explore how to use FaceTime® to make video calls with Apple iPhone 6. Learn how to create a Medical ID on your Apple iPhone 6. Learn how to turn Apple iPhone 6 off and back on again, the first step in troubleshooting. Discover how to view your health data on your Apple iPhone 6. Here's how to print your Verizon Cloud photos from your iPhone. Here's how to change the TTY settings on your iPhone. Here's how to turn Guided Access for your iPhone on or off. Here's how to configure the Guided Access settings for your iPhone. Here's how to manage RTT / TTY settings on your iPhone. Here's how to turn the Screen Time setting for your iPhone on or off. Here's how to set wallpaper as a background on your iPhone. Discover how to change the background of the Home screen on Apple iPhone 6. Here's how to change the emergency calling address for Wi-Fi Calling on your iPhone. Here's how to turn Wi-Fi Assist for your iPhone on or off. Here's how to add a Virtual Private Network to your iPhone. Here's how to determine if an active phone call is being transmitted on your iPhone via Wi-Fi Calling. Here's how to add an available Wi-Fi network to your iPhone. Here's how to add a Wi-Fi network to your iPhone if the one you wish to add doesn't display. When turned on, Wi-Fi Calling may improve indoor call quality for your iPhone. Here's how to remove a saved Wi-Fi network from your iPhone. Here's how to turn Wi-Fi for your iPhone on or off. Here's how to enable or disable the ability to join a Virtual Private Network (VPN) on your iPhone. Learn how to use Apple iPhone 6 to connect to a Wi-Fi network, so you can access the Internet without using data.